Located roughly 40 minutes east of Seattle in the Cascade Mountains, the dramatic 270-ft plunge of Snoqualmie Falls is well worth the trip. A two-acre park surrounds the waterfall and includes an observation deck perched on the cliffside. 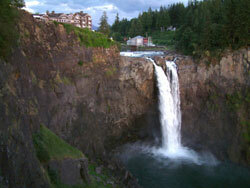 The views of the waterfall are spectacular both from the observation deck and from the trails to the river below. The deluxe Lodge and Spa is located above the falls, providing the luxuries of both a full service resort and an Asian-style spa. A meal at the Salish is highly recommended: both the Dining Room and the Attic Bistro offer an elegant dining experience with breathtaking views of the falls. More than 15,000 years ago glaciers carved out the deep recess of Puget Sound, creating a series of peninsulas, islands and inlets unlike any other place in the lower 48 states. The islands themselves possess great natural beauty, and each has their own particular way of life. Bainbridge Island lies roughly halfway down Puget Sound, and can be reached by ferry from Seattle or by road from the Kitsap Peninsula. Bainbridge is known to have a strong arts community, and the main town of Winslow is full of trendy cafes and interesting shops. Whidbey Island can be reached by ferry or by crossing the Deception Pass Bridge at the northern tip of the island. Quiet inns, historic towns, forests of white oak and Ebey's Landing National Historic Reserve-17,000 acres of protected nature and historic sites characterize Whidbey. Camano Island offers mountain views in four directions: Mount Baker to the north, the Cascade Mountains to the east, the Olympic Mountains to the west and Mount Rainier to the south. Camano has a thriving artist community, and is accessible by highway. The San Juan Islands are comprised of more than 700 islands and reefs; about 450 of which are large enough to be named. The four main islands-Shaw, Lopez, Orcas, and San Juan Island-are all accessible via ferry. The largest of these is Orcas Island, which includes the 5,175-acre Moran State Park. Within the park is the highest point in the San Juans, Mount Constitution, which offers excellent views of points in both Washington and Canada. San Juan Island features the largest town in the San Juans, Friday Harbor. This eclectic community is filled with excellent restaurants and great shopping. Lopez Island and Shaw Island are less traveled, and are marked by rolling farmland and rural coastline. Established in 1899, the 235,625 acres of Mount Rainier National Park are based around an active volcano encased in over 35 square miles of snow and ice. 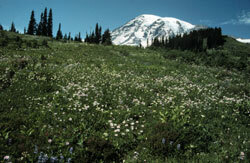 Old growth forests and wildflower meadows surround the mountain, and the elevation in the park ranges from 1,610 to 14,400 feet above sea level. The rustic architecture of the park's early structures has earned it designation as a National Historic Landmark District. Recreation opportunities are numerous regardless of the season. In the warmer months there are over 240 miles of trails to explore, including many day hike and nature trails of varying lengths. Backpackers may choose to utilize trailside camping sites, and cross-country camping and alpine camping are both open for more experienced and adventurous campers. There are six drive-in campgrounds inside the park, each with a number of sites. Mountain bikers have three areas open to them, and each are quite challenging with numerous elevation changes. Climbing is available for those who are well prepared and in good physical condition. Many of the lakes in the park are open to non-motorized boating as well. Sufficient snow in the wintertime opens the park up to a number of activities. Park rangers will mark many trails open for cross-country skiing and snowshoeing, and both snowboarding and snowmobiling are permitted in specified areas of the park when open. There are also a number of downhill trails open for skiers. The Snowplay Area at Paradise allows sliding, sledding, and tubing fun for families. The Visitor Center at Paradise is also the launching point for guided snowshoe tours for beginners. Today Washington produces more wine than any other state aside from California, and the quality of Washington wine is gaining esteem around the world. Washington's primary wine region lies in the central and eastern sections of the state, but a small winery region can be found outside the town of Woodinville just north of Lake Washington. Five wineries are open to the public on a regular basis, the perfect number for an afternoon of wine tasting. The Columbia Winery boasts the state's largest wine tasting bar and produces a nice range of wines. Chateau Ste. 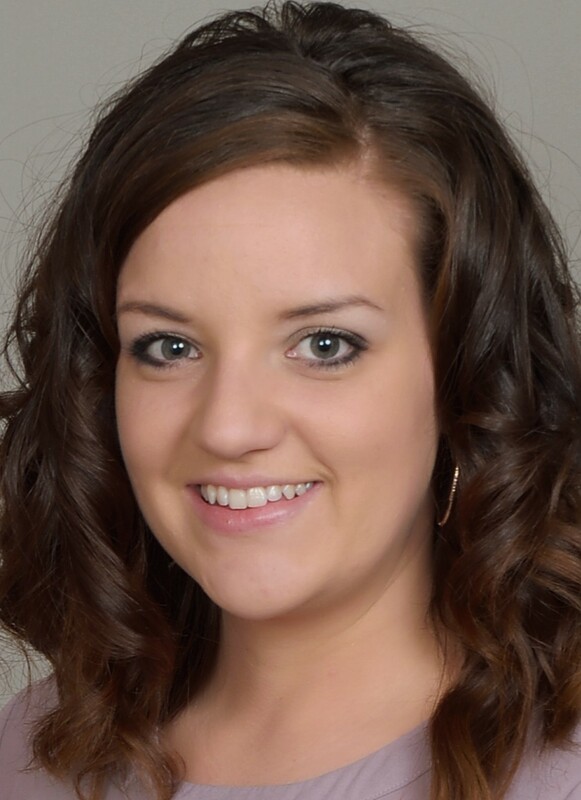 Michelle is just across the street, located in a beautiful mansion on a historic 1912 estate. The wine is of the highest quality, and the winery hosts a summer concert series featuring nationally recognized artists in an intimate environment. Farther north you'll find Silver Lake Winery, whose reds are particularly good. The small Facelli Winery is less known but likewise crafts some fantastic reds. Travel just a bit farther to DiStefano Winery, which is known for its full-bodied reds but produces some delicious whites as well. If you prefer a pint to a pinot noir, stop off at the Redhook Ale Brewery. This popular microbrewery offers tours as well as an onsite pub, and hosts outdoor movies in the summer. Aside from finely crafted beverage, you'll find several of the region's best restaurants nearby as well. The Herbfarm is internationally renowned for its lavish meals filled with organic vegetables, Northwest seafood and meats, wild vegetables and fresh herbs from their own garden. Reservations are hard to come by but well worth the effort. Don't miss brunch at the Barking Frog, where the unique dishes incorporate rich ingredients and perfect preparation. A visit to the quiet farming town of Snohomish will lead you to one of the area's best antique districts. The city expanded rapidly until 1897, when the county government was moved to Everett. 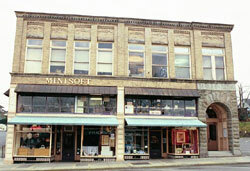 The slow development that followed actually helped to preserve the town's numerous turn-of-the-century buildings and homes. Antiques dealers began moving into buildings in the downtown area in the late 60's, and today there are more than 450 antiques dealers in town. The neighborhoods surrounding the downtown commercial district are lined with stunning Victorian homes. The public gets an opportunity to tour some of the most elegant homes during the Historical Society Home Tour, held in late September each year. Also in town is the Blackman House Museum, an 1879 Victorian home filled with period furnishings. For more information on Snohomish's historic district and antiques shopping, visit the Snohomish Chamber of Commerce website. Feel like viewing the sites for a short stint? Just a bit south of Seattle, there is Olympia, our state capital, which was named after the beautiful surrounding Olympic Mountain Range back in the 1850's. Here there is much to see and do. Come check out all the historic sites Olympia has to offer including the state capital, several museums, live theaters, farmers markets, and more. Don't forget to visit the amazing Yashiro Japanese Garden, which honors Olympia's sister city, Yashiro in Japan. Olympia is just a hop, skip, and an hour away from Seattle, depending on traffic of course. If excitement is what you're looking for, come check out Emerald Downs horse racetrack. With a stunning view of Mount Rainier in the background, Emerald Downs has been an exciting experience since the early 1930's. This track is especially known for its famous Longacres Mile. In an effort to put Washington horseracing on the map in 1935, Joe Gottstein offered an unheard of reward of $ 10,000 to the winner of the mile. At that time it was the highest payoff in the country and attracted racers from all around. It certainly gave Washington horseracing a lot of attention, and to this day is still the highlight of every year. So come here to find magnificent thoroughbreds, an amazing 167-acre facility, and incredible views.